What Appetite Suppressants Are Safe? There are two kinds of appetite suppressants: FDA approved drugs and natural supplements that control appetite. So which ones are safe? It may appear that FDA approved suppressants are safe, because they were evaluated for safety by the U.S. government. However, the truth is these are pharmaceutical chemicals that come with plethora of side effects and should be prescribed by doctors only in special cases when the benefits are greater than the risks. On the other hand dietary supplements are not reviewed by the FDA, so you may think they are not as safe as FDA approved drugs. The truth is that most dietary supplements are natural extracts from plants that have a gentle effect on the body and are much safer than FDA drugs, and that's why they are available without prescription. 5-HTP, Inulin, Biotin, Inositol, and Rose Hips are natural extracts from plants that have been shown to safely suppress appetite in several clinical studies. They are the key ingredients in our delicious Skinny Piggies gummy supplement. What Appetite Suppressant Works Best? Which Vitamin is an Appetite Suppressant? Are Appetite Suppressants Bad for You? What Fiber Gummies Are Gluten Free? How Fast do Fiber Gummies Work? How Much Fiber Supplements Per Day? What Fiber Supplements Lower Cholesterol? Tired of boring diet programs? Feelings of limitations? Having zero fun AT ALL? You may not be alone. Frankly, lots of people don't like diet food. It's certainly not pleasant refraining from foods you love, not pleasant feeling hungry, and surely not fun to work out when you'd rather just chill on the armchair with the newest TV episode of Gilmore Girls. Fortunately, now you can help your diet by enjoying a unique, natural appetite suppressing, Skinny Piggies! These are amazing fruit fiber gummies that lessen cravings for food and being hungry while helping your body to remain in fat loss mode. If you want to achieve this caloric deficiency, you have to either increase your burned calories via added physical activity or decrease your caloric intake. To obtain optimal results, you may want to do both. Skinny Piggies help you eat a lot less and reduce your caloric intake which makes achieving effective weight loss easier. Include added regular exercise to aid step up the weight loss process. If only weight loss was that easy. Though cutting back on your calories could seem simple, in practice your strong cravings will most likely make you pining after sweets day and night. You don't need to give into sugar binges. 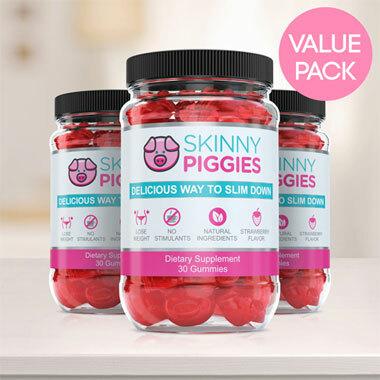 Skinny Piggies are delightful appetite suppressant vitamin gummies that naturally help reduce your appetite, meaning that your cravings will be soothed without you cheating on your weight loss diet. Hunger is for the most part driven by: energy intake and the stretch in the stomach. When you eat food, your stomach fills up and the stomach gets bigger. This is what creates the feeling of being full and stops you from eating more. 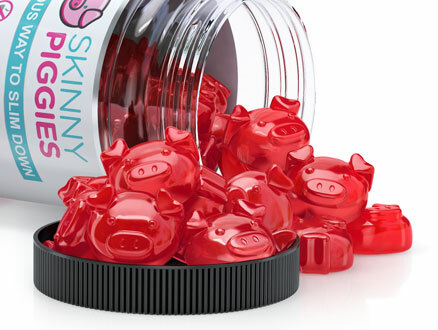 When you add Skinny Piggy gummies to your diet, you will feel fuller, faster. Chewing a Skinny Piggy with a glass of water just a half hour before eating dinner will cause it to form a soft gel in your stomach and gives you the feeling of having eaten a full meal. This means you can combat appetite and food cravings, hunger, and eat much less, without being starving all the time. The gel also enables your stomach to empty much slower leaving you feel satisfied for a longer period. The sooner you feel full, the less likely you are to continue to eat which allows you to eat fewer calories. As the viscous gel coats the food, it slows down the absorption of carbs and that normalizes your blood glucose. By preventing spikes in your blood sugar you prevent those pesky sugar cravings. When you avoid blood sugar spikes by slowing down the absorption of sugars you are also preventing it from being accumulated as body fat and that then causes the body to burn its stored fat for energy. The slower the digestion the longer you stay in fat loss mode. What's Special about Skinny Piggies? There's no end to the types of diet pills being sold on the market today. From diet pills to hunger suppressants, it's almost impossible to know what diet product will work for you. 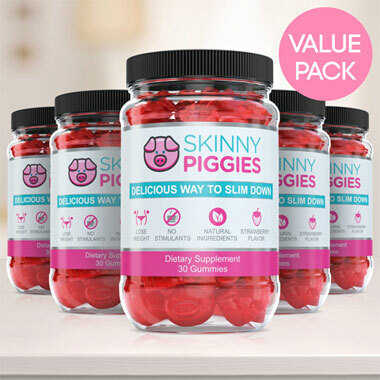 Sifting through the online research on each product is a fruitless task, but Skinny Piggies are unique for the following reasons. 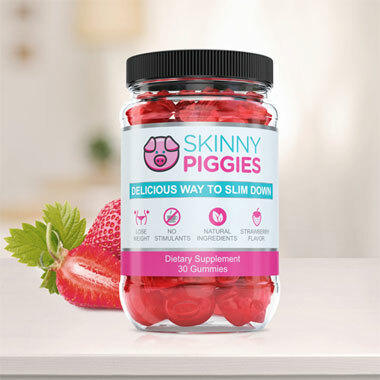 No Harsh Stimulants: Taking a weight loss product without caffeine means that you may take them at night, and our gentle formula means that Skinny Piggies are easy on sensitive digestive track. Genuine Ingredients: Unlike other diet supplements, it's actually possible to pronounce every ingredient in our gummies, so rest assured that you're eating high quality nutrition. Delicious Taste: Very few fat loss products actually taste great, and none have the same tasty taste of strawberries, that's why our gummies are a snack you will enjoy. Healthy Ingredients: In addition to helping you slim down, they will also support the healthy hair and nails and help your skin glowing. You will really love eating them so forgetting to take your supplements will no longer be an issue. They're delicious and anybody can get started right away. Try one gummy Piggie and we're sure they will become a highlight of your day.